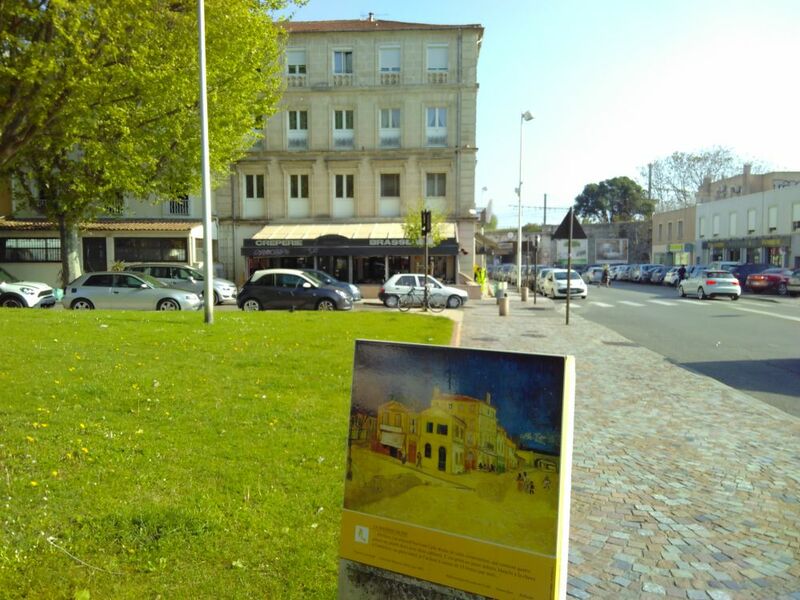 [Originally posted at robhopkins.net] Rob Hopkins visits Arles, and reflects on what Van Gogh’s painting ‘The Yellow House’ can teach us about Transition. 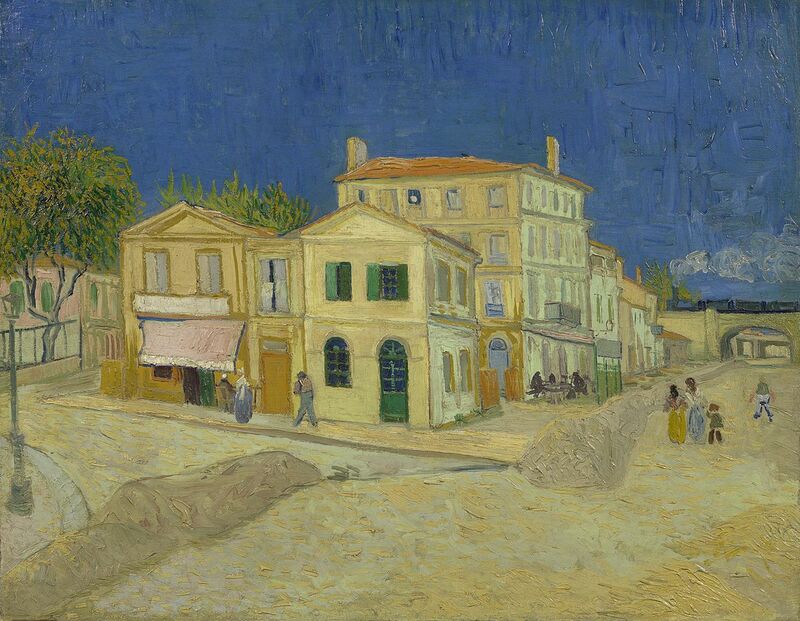 Van Gogh arrived here by train in the Spring of 1888, to get away from Paris (and his brother who, one suspects, was rather at the end of his tether after the two of them sharing a flat, his flat, for two years). He was also in search of beautiful things to paint, and better light to paint them in. He wasn’t disappointed. For a while he stayed in a hotel, until both he and the landlord got on each other’s nerves too much and Van Gogh started looking for something more permanent. Through contacts he had made, he discovered that a small house was available for rent, and he seized the opportunity. Initially he rented the downstairs as a studio, but then later took on the whole house. It was tiny, but it was his. He was filled with visions of creating a ‘Studio of the South’, inviting other artists to join him, where they would live like monks (albeit monks for whom drinking, smoking and regular visits to the local brothels was entirely acceptable). They would reimagine Western art and create remarkable work. He had the house painted yellow, a colour which for him represented happiness. ..”representing the house and its setting under a sulphur sun under a pure cobalt sky. The theme is a hard one! But that is exactly why I want to conquer it. Because it is fantastic, these yellow houses in the sun and also the incomparable freshness of the blue. All the ground is yellow too”. The Yellow House represented a place where anything was possible. This unremarkable place became a touchstone for the imagination, something beyond mere hope, it became an affirmation that this would indeed happen. The painting was willing it into being. Indeed, it assumed that it was inevitable. This simple little house, with its green shutters and vibrant yellow walls is a rallying call, an invitation, a powerful taste of what’s possible. I arrived in Place LaMartine at about 10am in the Spring sunshine. In front of the house is a marker which shows the position he painted it from, and shows where the house was. It no longer exists, having been destroyed by an Allied bomb in 1944 and replaced by a bistro. I sat on the grass in the sunshine and took it all in. It was curiously emotional, finally visiting a place I had read about for so long. I imagined what it might have been like to knock on the door in the autumn of 1888 when Van Gogh and Gaugin were both home. I imagined the strained atmosphere, the pipe smoke, the uncomfortable silences, the smell of turpentine, and bright canvases leaning against the walls. I imagined Van Gogh, a man whose output was prodigious, often producing at least one painting a day, as well as letters, drawings and other things, wouldn’t have much time for visitors. I imagined being given pretty short shrift and sent on my way, all the while craning my neck to see the remarkable artworks behind him. 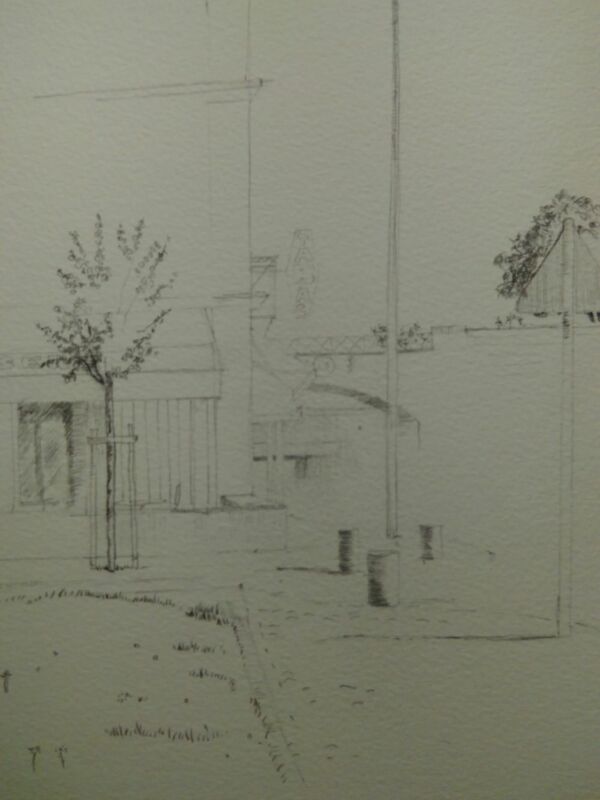 I took some time to pay tribute in the best way I could, by getting out my sketchbook and trying to capture the scene. In the hour or so I was drawing, several tour groups visited the spot, each guide telling more or less the same story: “lived here – painted – Gaugin arrived – didn’t get on so well – Van Gogh lost the plot and hacked his own ear off – presented it at the door of a brothel – Gaugin left, and Van Gogh was committed”. But they missed the important point. “In this house, Vincent Van Gogh, for six intense, passionate months of his life, painted as though his life depended on it. He imagined this house as a catalyst for a shift of global significance, a reimagining of art and its possibilities. And although the personal cost to him was enormous, he achieved his dream, albeit posthumously. The painting he made of this house still speaks to the power of the human mind to will the seemingly impossible into reality. And to do so with love, colour, passion and beauty. And we need it now more than we ever have”. At this moment, when the world is run by madmen and the concentration of CO2 reaches 410 parts per million for the first time in human history, when there are still reasons to remain optimistic, but equally convincing arguments not to, it’s time to put a print of The Yellow House somewhere so we see it every day. What could you catalyse where you live that would act in the same way? How could your community, your place, tell a story about what the future could be, a story that burns in bright colours? Because goodness knows we need those. There seems to be a universal consensus that the future is inevitably going to be crap, and more and more people retreating into what Zygmunt Bauman calls “retrotopia”, the idea that the 1950s represented the ideal we need to move back to. A recent poll in the UK showed that 9% of people who voted Leave would like to see pre-decimal currency reintroduced! In reality, we need to imagine something else, something new, bright, bold, beautiful. There is no reason that we couldn’t create a remarkable future, starting today. We know how to. We have all the pieces. We know the things that work. We know how to reimagine food, energy, housing, economics, culture, society. So let’s share and communicate this vision, sit down with others and make plans, start living as though it was already happening, enable others to feel that this is a future that burns bright, dazzling us with possibility. In a bright shade of yellow. Against a deep blue background. We need The Yellow House more than we ever have.